District and session judge Recruitment 2018 notification from Dima Hasao District is out for filling up various posts. Applications are Invited from the intending candidates who are citizen of India, within the age limit of 18 years to 38 years (Relaxation as per Govt. Rules) . 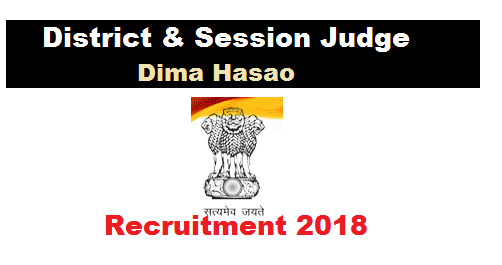 Following are the details of the posts under Dima Hasao District & Session Judge recruitment 2018 with educational qualification, age details, salary and all. Educational Qualification : Candidates must have completed or passed Class VIII standard. Educational Qualification : Candidates must have completed or passed HSLC or equivalent. Interested and qualified candidates may apply with standard form as published in Part IX of the Assam Gazette with self- attested photocopies of all testimonials In support of age, educational qualification, caste and experience if any, along with 3 (three) copies of recent passport size photographs for filling up the posts of Court Peon, Office Peon, Bungalow Peon and Jarikarakin the establishment of the District & Sessions Judge, Dlma Hasao. 1/ Age limit for all the posts is not below 18 (eighteen) years as on 01.01.2018 and upper age limit is as per rule in force. 2/ Candidates in service should apply through proper channel with NOC from his/her employer. 3/ 33% of the above posts are reserved for women candidates. 4/ A candidate need not apply separately for all the posts of peon. Only one application per candidate shall be accepted for all posts of peon. 5/ Candidate should submit along with the application, a self addressed envelope measuring 3″X6.5″, affixing postage stamp of Rs. 5/- on it. 6/ The name of the post applied for and contact number of the applicant must be clearly written on the top of the envelope. 7/ There will be a written test of 30 marks (Essay type) for the posts of Court Peon, Bunglow Peon and Office Peon and for Jarikarak the written test shall be of 50 marks (Essay type). A list of candidates who have qualified in the written test shall be published in the notice board of the District & Sessions Judge, Dima Hasao. 8/ Candidates who have qualified in the written test will be called for oral Interview. Candidates must bring along with them all testimonials in original, in terms of age, caste and Educational Qualification etc. during personal interview. 9/ No TA/DA will be paid for appearing in the written test/interview. 10/ Applications will be received only during office hours. No application will be received after 07.04.2018. 11/The local residents having experience will be given preference. 12/ The reservation of posts will be as per Govt. norms. 13/ Incomplete application will be rejected without informing the candidate. 14/ The appointing authority reserves the right to reject the candidature of any applicant who Is over qualified. 15/ The candidate shall mention the name of the post applied for on the envelope bearing the application.